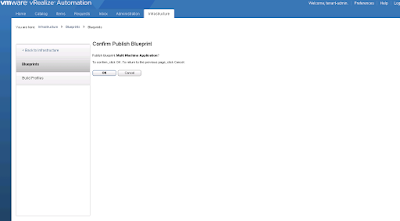 In our last couple of blog posts vRealize Automation Installation Part1 and vRealize Automation Installation Part 2 we understood various vRA components and talked about the installation of vRealize Automation. 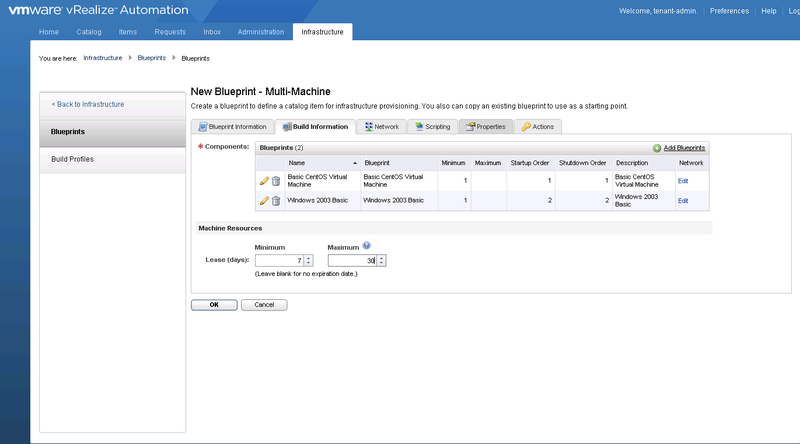 Spent some time today on vRA and created few multi machine blueprints so thought of updating the same in my blog. Machine blueprints are the complete specification for a virtual,cloud,or physical machine and specify how the machine is provisioned. 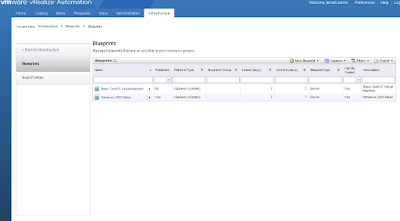 Blueprints are published as a catalog items and can be shared across all business groups or can be created local to a specific business group. Before proceeding further make sure we are logged in with the correct user, in the below screenshots i have logged in as tenant admin and created the blueprints. I Have already created two blueprints one for windows virtual machine and other one for Cent os virtual machine so as i can use them while creating multi machine blueprints. In the new blue print specify the name, Master (Copyable) allows business groups managers and tenant administrators to copy the blueprint when creating the blueprint. 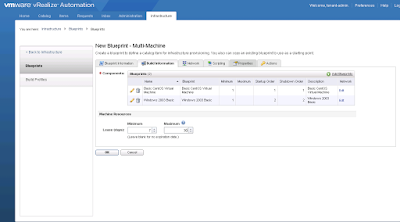 Display location on request can be used if the location has been defined in the vRealize Automation location file and a compute resource has been associated with that file. Shared Blueprint blueprint is visible to all the business groups. 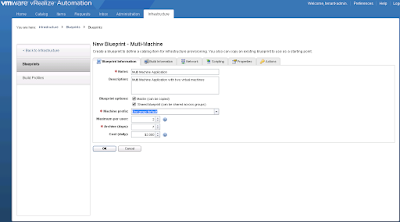 Machine Prefix Naming Structured of the newly created virtual machine. 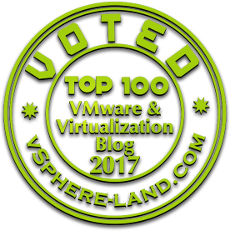 Archive (Days) Number of days archived virtual machine is available for reactivation. Build Information - Specify the blueprints to be added in multi machine blueprints and proceed further with the completion of creation of blueprint. 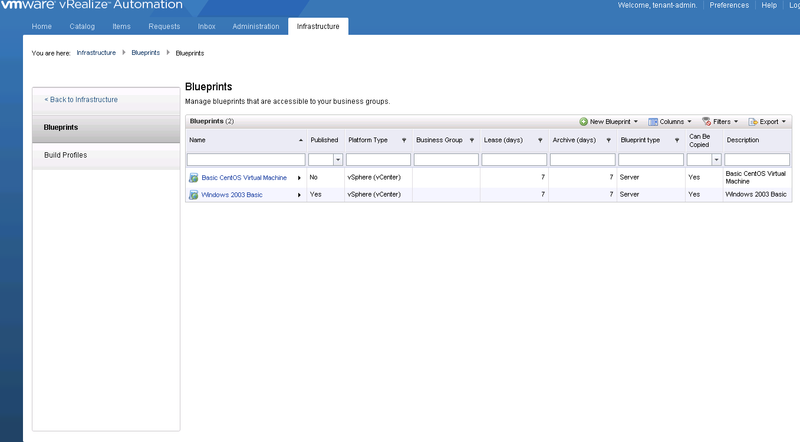 Before publishing the blueprint we can also specify custom properties which are normally used for modification of blueprints behaviour (specifying the OS image to use during provisioning) and actions tab talks about the possible operations which can be performed on those virtual machines which are provisioned using blueprints. 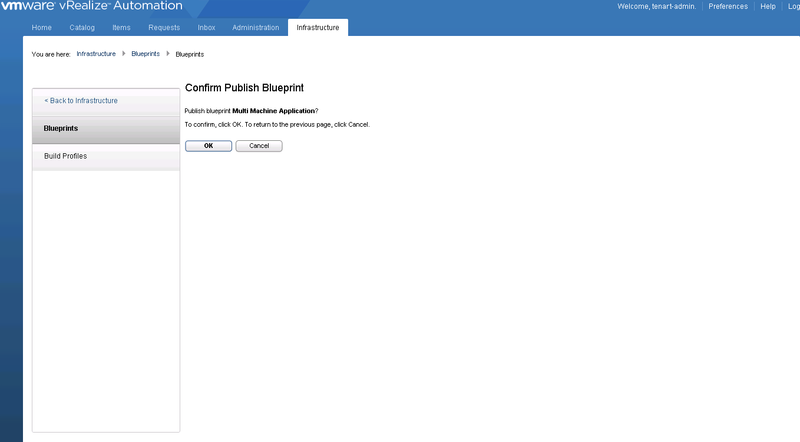 In order to make the blueprints appear as catalog items we need to publish them as by default blueprints are saved as drafts and must be manually published.